Murray Associates was the first TSCM firm with a polygraph policy to circumvent the “plant a bug, grow more work” mentality which was rampant at the time. Upon our discovery of bugging, wiretapping, or other forms of eavesdropping, clients have always had the right to verify our findings. The US Government lifted secrecy and sales restrictions on the MicroLab/FXR Non Linear Junction Detector. Murray Associates was the first in the private sector to utilize this unusual instrument which detected bugs even if they were “off” or had dead batteries! Miniature television cameras with AM micro-transmitters (900 MHz frequency range) became a major threat. 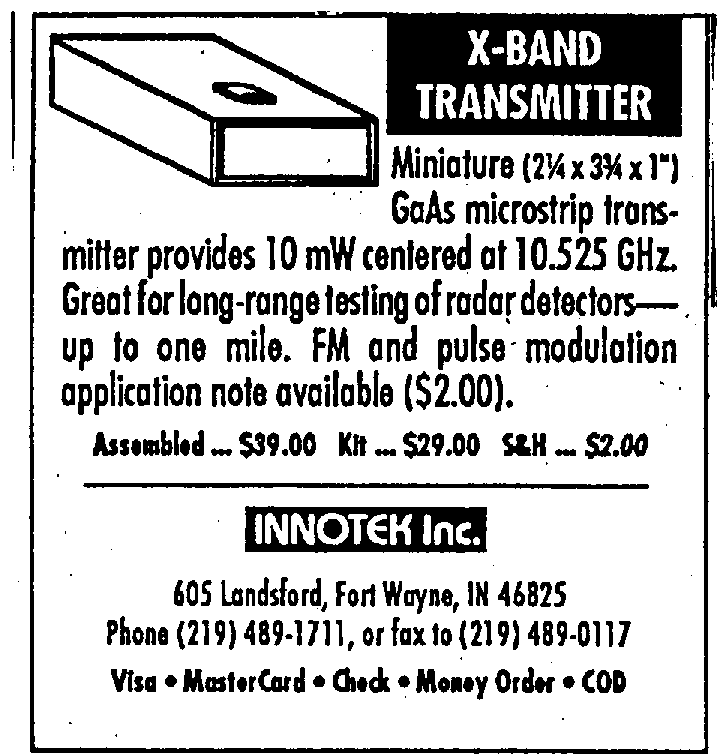 Murray Associates was the first countermeasures firm to purchase a spectrum analyzer (Tektronix 2710) capable of receiving and viewing these TV signals. Miniature television cameras with FM microtransmitters (2.4 GHz frequency range) become a major threat. Most “countermeasures” equipment couldn’t even see these signals. Drawing together various technologies, Murray Associates created a system that is the next step in the evolution of spectrum analysis – Radio-Reconnaissance Spectrum Analysis™. We begin experimenting with infrared thermal imaging technology in 1999. After a year of research, we purchased a $60,000.00 thermal imager and the Thermal Emissions Spectrum Analysis™ (TESA™) inspection technique is born. Wireless Local Area Networks become popular in many corporations and executive homes. So does inserting rogue wireless nodes into supposedly secure hard-wired systems. The threat… wireless wiretapping. Appropriate detection instrumentation is brought on board. At our clients’ request, Murray Associates established a local presence in the European Union and Southeast Asia. Sony releases the first price-practical ($6,000.) UV digital television camera. We experiment with bringing this major technical advancement into our field. Evidence of electronic eavesdropping installations are viewed and documented with reflected and absorbed ultraviolet light. Continuing research into new sensing instrumentation, we invested approximately $40,000.00 in government-level new NLJD instrumentation for our clients. One of the most exciting capabilities of the new equipment is their ability to “hear” video cameras hidden within objects like clocks, radios, furniture, ceilings, etc. A new Multifunction Digital Telephone Analyzer was released. We immediately upgraded, at a cost of $19,000.00. It combined the functions of multiple instruments into one unit. This made room for additional instrumentation in our kit and allowed the detection of digital voice leaks on phone lines. Spyware on “smart” cell phones hit critical mass this year. Clients and website visitors asked for a solution. What began as an executive briefing turned into a book – “Is My Cell Phone Bugged? : Everything You Need to Know to Keep Your Mobile Conversations Private” is released in early 2011. Our staff completed – law enforcement oriented – cell phone forensics training, taught by the Chief Detective in charge of the Pennsylvania State Police Digital Forensics Lab at the time. Also our travel kit capabilities are upgraded with the acquisition of a 50 kHz to 24 GHz spectrum analyzer. Electronic components continue to get smaller and standard non-linear junction detection was not keeping pace. When new technology became available, we were the first to offer its use to the private sector in the U.S.
SpyWarn™ 2.0 the forensic spyware evaluation app for Android is publicly launched on Google Play. This is quickly followed by the SpyWarn™ Anti-Spyware Kit for Smartphones. This security hardware is exclusively available to Murray Associates clients, free of charge. Video voyeurism using covert spycams is a serious problem affecting individuals and organizations alike. Murray Associates creates Spycam Detection, an on-line training program. The course provides organizations with the basic security training necessary to mitigate video voyeurism risk for their employees and visitors. Hosted at Udemy. We introduced 360º degree photographic documentation of the sensitive areas we inspect as part of our electronic surveillance detection (TSCM) protocol. This assures we will detect subtle environmental changes during re-inspections. Radio-frequency spectrum analysis technology advanced, and we kept pace. Three new Software Defined Surveillance Receivers (SDR) were added to our field kits. We enhanced our forensics capabilities with smartphone and tablet Spyware Detection and Data Extraction. Services may be conducted at client locations, or via sending the devices via FedEx to our lab. Safe. Convenient. Private.